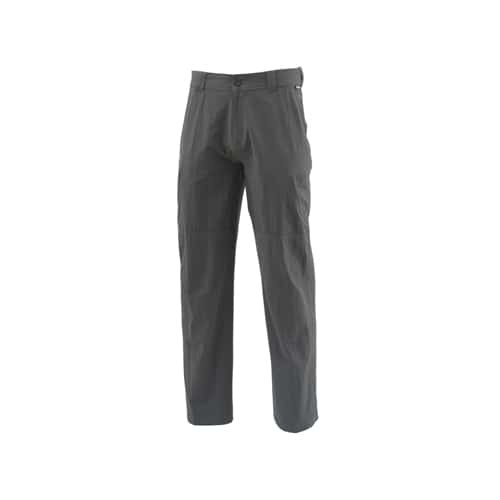 An all time favorite with fly fisherman, the Simms Guide Pants with COR3-activated fabric blend of nylon/spandex wicks moisture, shields sun, and neutralizes odor, while articulated knees and a gusseted crotch make getting into prime casting positions effortless. Storage solutions include one zip and hook-and-loop secure cargo pockets, zip-secure back pocket, slash hand pockets tailored for accessories, and an internal cell phone stash. Traditional Fit and a plush, adjustable brushed tricot-lined waist come standard.